The sporty compact car Subaru and Toyota were developing together has been put on hold because of the worldwide economic slowdown, both companies confirm. The program had been developing a pair of sporty small cars for sale by both automakers in 2011. The companies' other high-profile collaboration, the assembly of Toyota Camrys in Subaru's Lafayette, Ind., plant, remains intact. Toyota took a small stake in Subaru when GM ended its relationship with the all-wheel drive specialist in 2005. The 2+2 compact sporty car had been slated to use a version of the Subaru Impreza's platform, horizontally opposed boxer engine and transmission. It reportedly modified Subaru's all-wheel drive drivetrain to a rear-drive setup and moved the engine slightly rearward in the chassis to improve weight distribution. The car would have filled one of the few obvious gaps in Toyota's lineup, a small and affordable sporty car. It would also have given Subaru a performance model priced below the $24,995 all-wheel drive Impreza WRX. The Toyota and Subaru models reportedly had different exterior designs. This one looks very similar to the rendering of the future Supra that was circulating around the web 4 years ago. I think it looks fairly nice (Although I'm not exactly digging the front lights too much). Thanks for sharing the link, too jruhi! IL Insider: The "Toyobaru" Is "Still on Track"
To be built by Subaru and based off a new Subaru-developed platform (converted to rear-wheel drive), the sports car will also run with Subaru's prized boxer 2.0-liter engine. There will be both Toyota and Subaru versions of the car, each looking different but with the same normally aspirated flat-4 engine under the hood. The Big 3 Detroit carmakers have been capturing the world's headlines with their economic and product woes for the past several months, but the truth of the situation is that the whole industry is struggling. Toyota recently announced its first operating loss in 71 years, and then decided to push back development on its RWD sports car joint project with Subaru. But the project, feared dead, is in fact still simmering. According to an anonymous project planner on the sidelines of the Geneva Motor Show, the car would be on European streets by 2011. Developing the information further, the source told Automotive News that the car would sit in about the same market space as the old Celica used to occupy. Subaru's parent company, Fuji Heavy Industries, has been working with Toyota on the development of a new RWD sports car for about a year now, but the continuing soft market and poor 2009 outlook led the companies to shelve work on the car. Saving production costs in a cash-strapped market is part of the reasoning, but also introducing a new car right now would almost certainly doom it to sales failure. Another reason for the delay is the need to add D4S direct injection to the car's boxer-four for better power and efficiency, Toyota told the press at the Tokyo Auto Salon last month. The car's chassis and body development are finished, with the project bearing the code-name '086A' - a possible nod to the classic AE86 Corolla/Trueno that the joint project has been compared to so often. But the Toyota-Subaru joint project isn't alone. All new production projects are being reviewed in an effort to help realign investment and development budgets with newly reduced profit forecasts. Last November the Japanese carmaker cut its future profit figures by 56% thanks primarily to poor sales in Europe and the U.S. Earlier reports had pegged the 086A to begin production in March, 2012. Original plans had previously put the car's launch in late 2011, branded as a Scion in the U.S. The price target for the car is still intended to make the ¥2,000,000 mark, though whether it will sell in the U.S. for the equivalent $21,300 is up for debate. Looks like the Celica is back!!!! The last report about the on again/off again sports car being developed jointly by Toyota and Subaru was that it's on again. 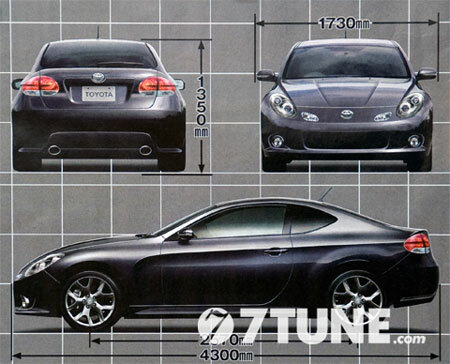 Today comes word from L'Automobile in France that not only is the rear-wheel-drive Toyubaru going to happen, but it will arrive bearing the Celica name sometime in 2010. If Wikipedia is to be believed, this would be the eighth generation of the Celica, which traces its roots all the way back to 1970 when it debuted in Japan as an inexpensive rear-wheel-drive sports car. Through the years it switched to front- and all-wheel drive, with the final seventh generation Celica sold from 2000 - 2005 being a strict cart puller. L'Automobile claims that Thierry Dombreval, Toyota's VP of sales and marketing in France, spilled the beans on reviving the Celica name, so we won't consider this news solid until a second source comes forward or Toyota officially confirms it, neither of which is likely to happen. So for now all you Celica fans should just sit tight and light a few candles for your cause. If it wasn't obvious to most of you already, this decision to go ahead with the Celica was due to the massive pre-orders for the Genesis two door. If that is true, I sure hope Toyota is aware many of the pre ordered 4 cylinder cars were because of the tuning potential. Without a turbo nobody cares. From all the accounts I've read about the neo-Celica/Toyobaru, I'd say it was never really cancelled, and the delay of about 6 months to a year was as much about fitting direct injection to the base 2-liter naturally aspirated Subaru-sourced flat four as about hesitation over bringing it out in a crappy economy. Again, from what I've read, there might be a turbo, possibly AWD version later, but I don't think it will be available at launch. The economy put this vehicle on hiatus. And I just talked to some of my colleagues about the news on the internet about the 'go ahead' and they are saying the vehicle is actually still on hold. However the Genesis pre-order has got TMC talking. The economy put this vehicle on hiatus. And I just talked to some of my colleagues about the news on the internet about the 'go ahead' and they are saying the vehicle is actually still on hold. Wow! There are so many conflicting "It's on hold/no, it's just delayed a bit" stories, it drives you crazy and makes your head spin. The "it's only delayed a bit so that we could add direct injection" stories are attributed directly to Akio Toyoda at the 2009 Tokyo Auto Salon, from what I read somewhere. Still, I consider ISZach to be a VERY credible source. It would be great if they stuck the STi engine in the back as a mid engine! Think Posche! I guess we have the Genesis to partially thank lol.